First in Math is a comprehensive online resource for K-8 mathematics. It uses an engaging and interactive game based approach to support mastery and encourage practice. Practice is self-directed and progression based. Learners receive immediate feedback to help develop their problem solving and reasoning skills, building the foundation for algebra in higher grades. The game also uses friendly competition, through ranking and virtual award stickers, to motivate learners. Other key features include the ability for teachers to track student progress and family logins. The original value appears to lie in the notion that this resource will engage learners to the point where they will want to practice math, just like they would a sport. The First In Math website states that they aim to make math appealing and accessible through a cost-effective instructional tool. Robert Sun also states that his goal is to create a new generation of thinkers. Robert Sun is the founder, chairman, president and chief executive of Suntex International Inc. He has an impressive background that traverses the titles of inventor, engineer, entrepreneur and social activist. His educational background is in electrical engineering and he spent 7 years working as a senior project engineer. He holds a number of US patents and originally developed a successful card based mathematics game, 24 Game. Over 10 million students use his games. Having a varied background he is likely skilled in a number of areas that have proven to benefit his ventures. He has been involved with a number of organizations including the Pennsylvania State Board of Education. He has also won a number of awards including: Asian Entrepreneur of the Year Award (2008) and a US Congressional Medal of Distinction (2008). Based on his community achievements he appears to be a highly self-motivated individual with strong networking connections. 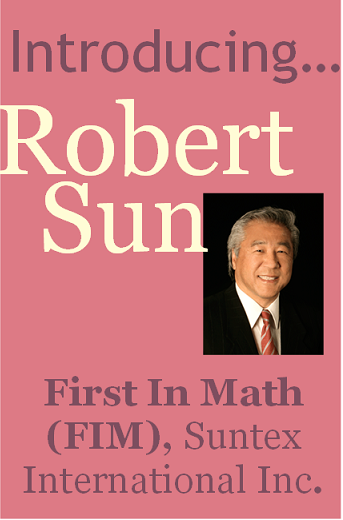 The First In Math website describes Sun as a mixture of creativity and technical skills and that he balances the intellectual with the practical. The following statement is found on his website, “a student of Eastern philosophy, Sun believes that we have the power to direct or influence our life energy. He knows that if he thinks positively enough about making something happen, it will.” A philosophy likely shared by many successful entrepreneurs. It was difficult to find any information about other team members. The only thing I found was that Suntex International Inc. employs 10-19 people. Based on the website and the estimated annual revenue of the company, I suspect that he has assembled a good quality team. Yes, I would invest in this venture, as Evernote seemed to have a fit within the current App market and of direct use to a vast client base. This venture is a product and service, seeking to serve as a one-stop-shop for storage and catologue of an individual or business’ notes, important information etc. in the form of images, text, and audio and can be accessed from multiple devices. This pitcher highlights the product’s ability to catalogue your info for easy access and searchability, unlimited storage (at a fee), compatibility with multiple operating systems and cloud-like features to be accessed from all of your devices. The pitch did not specify how consumers would be sought after, I am just assuming through something like an APP store. This would need to be expanded upon for sure, as accessing your consumer base is crucial to running a viable business. As well, there was not specific details regarding whether a pilot has been conducted, or a consumer poll to test interest. The pitch as completed by the CEO, who provided significant detail, exuded confidence and product knowledge, and he explained the product -scheme if you will, the two different products (ie. the free product and then the priced product), how they are different and of course the benefit of the priced product. 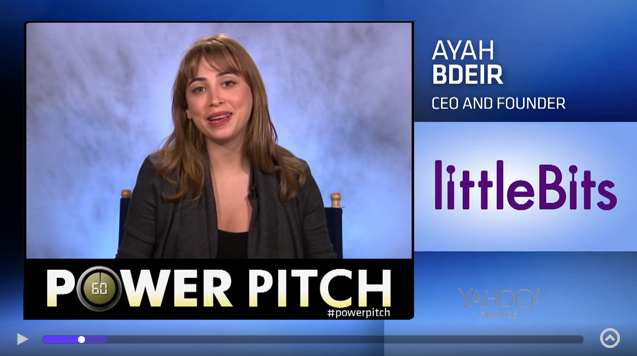 What attracted me to this pitch was how the CEO was able to relate to my needs, as soon as he described the product, what it did and how it fit into our lives in and amongst all of our other technologies I could see how it is useful, how it provided continuity when we are dealing with such varieties of technology. No I would not invest in this venture, as I found the pitch to lack the information required to ensure credibility of the project, as well as the actual workings of the MentoringMe program. MentoringMe attempts to fill the gap of on-going/continuing learning for teachers, specifically highlighting the need for ed tech training for older generation teachers who have either been slow to adopt of non-adopting of new technologies for learning. This gap would be filled through one-on-one mentoring by experienced teachers for inexperienced teachers via an online platform. The service being provided is an online hosting site that allows individuals to create profiles, link with other teachers who require training in a specific field and from there, the learning begins (opportunity to foster reciprocal learning transactions). This service provides training for teachers outside of their current physical district, allowing for diverse experiences (opportunity to explore personal interest or expand their knowledge base even when such learning is not available within their own school district), it provides an asynchronous platform accessible to individual needs, and it has the opportunity to harbor a vast pool of individuals with diverse and complex expertise. In terms of marketing, there was very limited information in regards to how this product/service is to be marketed and how they intend on reaching this vast pool of experts/teachers/learners. This is problematic because the pool of individuals is required to have this venture be successful. There was also no information regarding cost, such as operational funding requirements, cost to the customer, etc. There is a real lack of information regarding the credibility of the individuals who are pitching, what kind of knowledge, market research or need has been identified and where was it identified? There is also a lack of information regarding the pilot project, who participated (in terms of their credibility and how it is contributing to their workplace etc), what kind of time period and examples of success. In looking at this overall pitch, there was a lot of questions that remain unanswered as to the overall validity and function of the services that are the foundation of this venture and therefore I would not support this pitch. I also think that in looking at current platforms that exist, blogs, chat rooms, social and professional networking sites, this service may already exist and be free (ie. MOOC’s). How did iScuela came into being? iScuela was born to deliver high quality education at affordable price to school going children. We started our journey 3 years ago in India where we found that many smaller towns and rural areas don’t have infrastructure or even teachers to educate the children. We thought of building a product where we felt that if we cant bring the teachers to the students, maybe we can bring education to them using technology. Ever since we have been focusing on building a level playing field for children across the globe. After all the experience we have collected, we would now like to build a product using the latest technology for K-12 students. Due to the ever rising cost to obtain quality education, we want to build affordable platform that provides high quality education to all. Major reason for the high drop out rate in schools is lack of interest and poor performance at school. iScuela aims to make learning engaging and fun which will aid the child to learn better at their own pace. Hence, improvement at school level. Children are resorting to rote learning instead of understanding the concepts being taught. Just memorizing content will not stay with the children for long and this will pose significant challenges in their career as their fundamentals would not be clear. iScuela aims to provide an environment which enables the child to understand and relate to the content matter. NO, I would not invest in this venture. The pitch provides a pain point that does truly exist, providing students with adequate support, decreasing teacher workloads and improving parent communication but the solution is not unique enough. 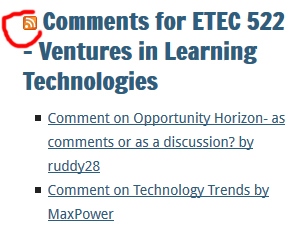 For example, I am currently using the LMS Desire2Learn and most of the issues he exposes in his pitch I can address very simply within the LMS. My math courses have built in self-assessments that are automatically marked and help fine tune students skills. The results of the assessments and progress in the course can easily be viewed by parents when they are set up with an auditor account. As you can see a number of key areas were not addressed in the pitch. Furthermore, it is unclear if the perceived pain point is shared among others or if it is a pain point perceived solely by the product developer. The pitch would be stronger if he addressed ideas such as increased student motivation and performance rather than filling apparent gaps in the curriculum. I was also confused by his description of the product as a learning management system that covers business, finance and economics. The term learning management system invokes something along the lines of Blackboard, a tool used to deliver and support courses. It is unclear if the product is a packaged course or something else. 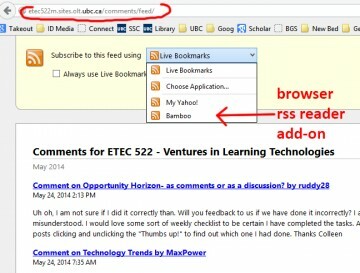 Thanks David and David for including RSS feed links in the sidebar as well as “Radio 522” for keeping track of recent comments! This is an asset to stay on top of site activity. I’m wondering if it might be useful to have a brief mention on the Radio 522 page (or elsewhere) informing students how RSS feeds can be used/saved/subscribed to? I had a previous class (565A) which required the use of a feed reader, and I noticed that most classmates had never used one, or didn’t know that they could find/install a feed manager. Might be useful to list some browser add-ons/extensions or even apps for this? Now I can get new comment notifications so I don’t miss anything, which is awesome! PS. 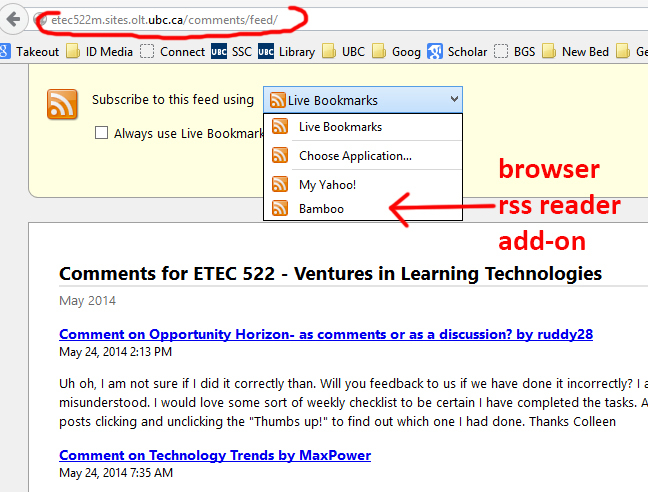 The nested commenting tools work great now! The following three links come from MindShare Learning based in Toronto. The first is the EdTech Teacher Survey which isn’t actually a projection source but it does give you a Canadian perspective. The second is Top Ten EdTech Predictions. 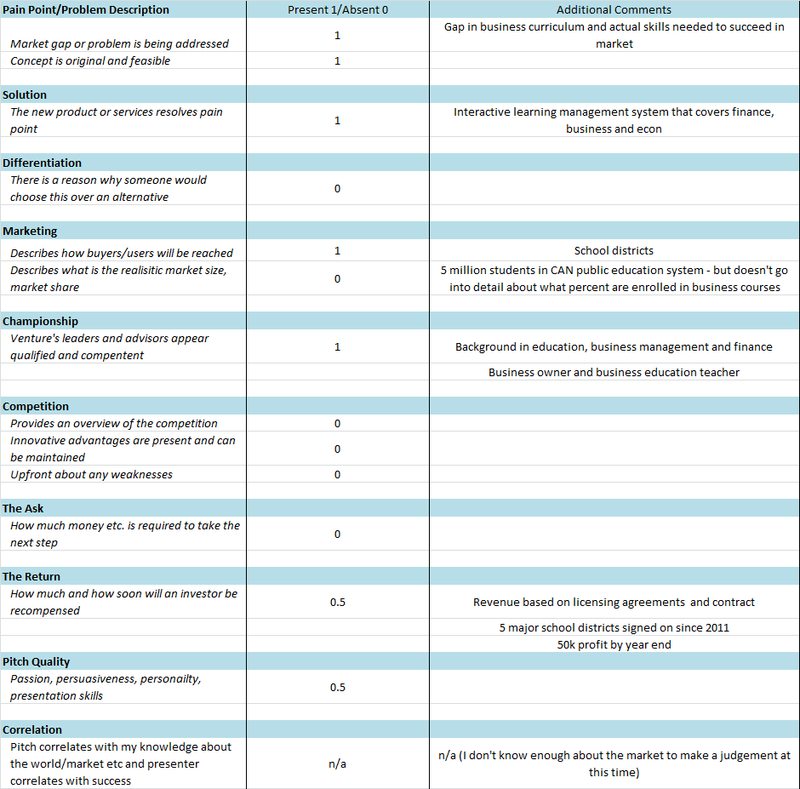 This brief list give a general overview of the Canadian technology landscape. MindShare Learning works with educators, school districts, universities and businesses (K-20) across Canada and as such the team there has a good handle on what is happening across Canada in regard to technology, innovation and education. The list basically repeats what the other lists talk about but it does include some specific Canadian content which makes it a quick, useful read. The third are the monthly Top Ten reports. These reports include infographics, podcasts with thought leaders, educators and entrepreneurs, industry and ministry news. Again, the value is much of this curated list has a Canadian focus which is refreshing in the EdTech space. Innovation is a driver of growth and well-being. New technologies, products, services and organisations create jobs and rejuvenate industries – while making others obsolete. To reap the gains of innovation, policy makers need to understand how the way we innovate is changing and what this implies for education and training policies. The NMC (New Media Consortium) is an international community of experts in educational technology — from the practitioners who work with new technologies on campuses every day; to the visionaries who are shaping the future of learning at think tanks, labs, and research centers; to its staff and board of directors; to the advisory boards and others helping the NMC conduct cutting edge research. NMC Horizon Reports separately cover Higher Education, K-12, Museums and Libraries. THE Journal is dedicated to informing and educating K-12 senior-level district and school administrators, technologists, and tech-savvy educators within districts, schools, and classrooms to improve and advance the learning process through the use of technology. Launched in 1972, THE Journal was the first magazine to cover education technology. THE Journal is the leading resource for administrative, technical, and academic technology leaders in K-12 education. Each year, Gartner Research compiles a list of the top technology trends that have the potential to affect individuals, businesses and IT organizations during the next three years. For the second consecutive year, the Nexus of Forces — mobile, social, cloud and information — permeates most of Gartner’s Top 10 list as it continues to drive change and create new opportunities. The EDUCAUSE Learning Initiative’s (ELI’s) 7 Things You Should Know About … TM series provides concise information on emerging learning technologies and related practices. Each brief focuses on a single technology or practice. by buyer segment, by region, and/or by country. Ambient Insight offers country profiles for over 150 countries. 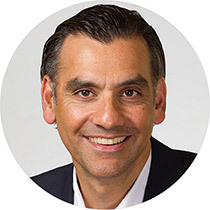 Gartner Inc. provides a glimpse into the future. Their report focuses on the next top 10 technologies that have either grown into game changing technology or have the potential to grow into one. This review will focus on the technologies I feel will have the largest impact education. I have merged some of the top 10 technologies, as I feel they are directly related. Change: Microsoft is being attacked on two fronts; mobile devices are becoming more popular than PCs and Microsoft only has 20% of the mobile market. Impact on Education: Every school that has the adequate budget currently has either an Apple computer or PC located in classrooms or libraries. With a shift towards mobile devices will the need for a full labs still be needed? A school that advocated BYOT (Bring your own technology) could potential reduce its need for dedicated computer labs. Apps like Socrative are making mobile devices a viable educational tool. Impact on Education: Traditionally students have been limited to their access to school material and learning programs to a physical building. As the capability of clouds services increases, the opportunity to move educational resources to the cloud will only increase. In addition, as cloud services get more efficient, the memory capabilities of PCs or handhelds will become less relevant, whereas the need for larger Internet bandwidth will increase. Schools will potentially move away from investing in labs and servers and move towards providing larger Internet bandwidth. Gartner Inc. delivers a concise and simple list of potential future technologies. This is an invaluable resource to keep on top of new emerging technologies that could potentially affect education. Apparently both Flickr and WordPress have been updated since I used them last. I inserted a Flickr image in my intro using the url but this will not allow me to add captions and titles for attributions. Is there another way to do this? You’ve heard of product design, graphic design, fashion design, architecture, etc, but Experience Design is the invisible frontier of human engagement. As mobile technologies continue to get smaller and more capable, they are beginning to disappear from our physical awareness without letting go of our attention – in fact, they are cleverly meshing our physical and digital worlds into an integrated and augmented attention that can be interwoven with ‘stories’ to enhance our purpose, presence, sociability, etc. Experience Design is what mobile technologies were born to enable. We have lived so long with the monolithic linear narratives that were the best experiences our other media have been able to deliver, that the opportunity of authoring open, social, synchronous, real-world narratives is unliteral and unnatural for us. Welcome to the new natural, if you’re bold enough to author it. The opportunities for learning are breathtaking. Social media is far more than Facebook. You don’t have to look deeper than Pinterest and Evernote to see valuable potential for the classroom environment. Every classroom is inherently a social space, so Social Media in the Classroom is an inevitable and substantial part of the future of education. The breadth & penetration of social media into every individual’s life has made it essential to multiple frontiers of informal learning; the evolution to formal learning has begun. A Makerspace is a physical location where people gather to share resources and knowledge, work on projects, network, and build. Makerspaces provide tools and working room in a community environment—a library, community center, private organization, or campus. Many are primarily used for technological experimentation, hardware development, and idea prototyping, but increasingly, self-directed individual inventors and creative teams are using makerspaces to build projects in fields other than engineering and technology. Makerspaces are zones of self-directed learning, providing a physical laboratory for inquiry-based learning and validating the drive for discovery that defines the researcher and the scholar. Digital, physical & blended Makerspaces offer a playful, purposeful alternative to traditional self-guided and collaborative learning environments. Are they the next generation of the classroom, or will they also transform informal learning markets such as community centres, science museums & children’s museums? Higher education is entering a new, evolutionary phase defined by connections between everything and everyone. Connected learning is rooted in the active participation of students, instructors, advisors, and collaborators, offering the ability to connect courses, people, and resources to develop unique personalized learning pathways. This vision of education is of particular interest to those concerned with learner success and the growing role that collaboration plays in all facets of higher education. Connected learning will reshape both business and learning models in higher education, requiring not just the acquisition of knowledge but also an understanding of how to use connections to find answers, seek out mentors and experts, investigate procedures, experiment with possibilities, and develop competencies. Connected Learning is the intended realization of the theory of Connectivism. Can it be feasibly implemented in the classroom or is it part of the fragmentation of the traditional classroom and school? An API is an Application Programming Interface, essentially a structured way for machines to talk with each other. The Tin Can API (sometimes known as the Experience API) is an emerging interface for learning technology that makes it possible to collect data about the wide range of experiences a person has (online and offline). This API captures data in a consistent format about a person or group’s activities from many technologies. Very different systems are able to securely communicate by capturing and sharing this stream of activities using Tin Can’s simple vocabulary. The basic idea is that people don’t learn at a single place or time, or on a single device, so how can we seamlessly support learning however it happens for them? The Tin Can API is an attempt to enable this transparent learning conversation to happen. If it catches on it will have transformative implications for every dimension of education. An Intelligent Tutoring System is computer software designed to simulate a human tutor’s behavior and guidance. Because these systems are able to interpret complex student responses and can learn as they operate, they are able to discern where and why a student’s understanding has gone astray and to offer hints to help the student understand the material at hand. Intelligent tutors provide many of the benefits of a human tutor to very large numbers of students. Intelligent tutoring systems can also provide real-time data to instructors and developers looking to refine teaching methods. Is an ITS the first salvo of the campaign toward software teachers in the classroom, or is it the ultimate teacher’s aide? As brilliant as most software and apps might seem, they are still severely awareness-disabled, meaning they don’t know and can’t respond to simple user contexts such as who I am, where I am, what grade I’m in, what class this is, what level I’ve achieved, what my learning style is, etc. The objective of Adaptive Software is that discrete levels of context awareness allows it to respond constructively to arising learning situations. While Artificial Intelligence (AI) remains futuristic, Adaptive Software requires far more basic response capabilities that are possible now. For example, context-awareness is critical for emerging mobile apps. The venture opportunity is for application developers and instructional designers to develop accountability-driven pedagogical models focused on the learning experience. Tablets and related devices have redefined publishing, including textbooks. No longer is textbook content necessarily closed, static and non-interactive. The growing expectation of both teachers and students is that Digital Textbooks must deliver a rich, engaging, responsive journey – a thrilling new kind of learning experience. Digital Textbooks offer a range of highly-creative and significantly disruptive product and service opportunities for publishers, authors, media creators, content aggregators, subject-matter experts, education providers, and tutors. A Massively Open Online Course (MOOC) is an emerging model for interactive online learning experiences designed to accommodate possibly unlimited numbers of learners who potentially arrive, attend, participate, and leave on their own terms. MOOCs can take advantage of existing social media and gaming environments as platforms to host both formal and informal learning experiences. MOOCs are primarily a ‘mash up’ opportunity domain, where new ventures will orchestrate trends, tools, and applications to serve audiences and their learning demands in creative, accessible and typically non-traditional ways. There are exciting opportunities for disruptively new ventures, and for existing ventures to pioneer new markets. Game-Based Learning seeks to apply the technologies and engagement factors of the hyper-successful electronic games sector, and of games more generally, to create effective learning experiences. This includes everything from the creation of original games with learning outcomes embedded in the gameplay (“serious games”) to the game-like animation (“gamification”) of more traditional learning approaches . Venture opportunities in Game-Based Learning are available to publishers, game designers, instructional designers, inventors, educators, etc, with practically no age or subject restrictions. The rapid diversification of gaming platforms (e.g. Wii, Kinect, tablet, mobile, etc,) is expanding the opportunity domain. While tablet and smart phone manufacturers are churning forward at a breakneck pace, making a fortune on humanity’s device-lust, the compelling back-story is what these devices can do – the proliferation of Apps. And while addiction and burn-out on the distracting nature of most apps is already big news, there is also a rapid emergence of meaningful, productive and educational apps. The app-world as a resource for learning is huge. It may seem like the design of successful Apps is pure chance, and less likely than the lottery. However, as app-capable devices permeate learning environments the opportunity arises to design apps that are deliberated coupled in effective ways with every dimension of the learning experience. Companies like IBM are building “Smart Cities” based on distributed sensors in roads, pipe, etc, providing feedback to control systems. This is part of a general emerging market called the Internet of Things (IoT) where heretofore inanimate, mute objects are becoming part of an intelligent, active, behind-the-scenes conversation. So what about “Smart Schools”, where the all of the tools, resources, furniture and infrastructure of a school get involved in the learning conversation? While relatively few physical objects might seem like immediate candidates to be given a useful IoT voice, currently wired systems including learning software and hardware are waiting to be heard. Enabling and collecting those voices, and organizing the conversation, presents a set of opportunities in classroom management, school management, security, etc. The learning commons, sometimes called an “information commons,” has evolved from a combination library and computer lab into a full-service learning, research, and project space. As a place where students can meet, talk, study, and use “borrowed” equipment, the Modern Learning Commons brings together the functions of libraries, labs, lounges, and seminar areas in a single community gathering place. Venture opportunities related to Modern Learning Commons focus on products and services that support schools, education systems, adult learning programs and corporate learning environments to flexibly integrate tools and content that serve their audiences learning objectives. The Visual-Intensive Learning (VIL) marketplace recognizes the rapid trend away from text-intensive information environments to visually-dominated web experiences that is apparent on most web sites but is championed most specifically by sites such as YouTube and Pinterest, as well as immersive collaborative environments and games. The concept of a “visual learner” is not new, but the streaming, collaborative and social capacity for visual interaction and exploration is blossoming rapidly. VIL is also the most significant dynamic of tablet and smartphone devices, simply for their lack of screen real estate. Venture opportunities related to Visual-Intensive Learning surround the strategic application and extension of existing tools into existing and new learning environments, as well as the development of custom tools that leverage the trending visual dominance of the web experience for learning. In the corporate sector IT managers are trying to cope with the ‘impossible’ situation that workers are insisting on coming to work, and doing their work, with their own mobile and work devices and preferred software (Bring Your Own Device or Bring Your Own Technology (BYOT), creating (for the managers, they say) a tsunami of technology management, security, etc, problems. For the workers, they simply know they are more productive and happy using their own devices. The same trend is already dominant in post-secondary and will inevitably prevail in K-12 as devices become more ubiquitous, economical, robust and personalized. There’s no question that BYOT will ultimately be cheaper and more efficient for both formal and informal education providers, so this transition creates a set of venture opportunities surrounding the content, infrastructure and management of the provision of learning. A dream of educators forever, Personalized Learning is reaching a tipping point in terms of the technologies available for realistic implementations. This marketplace opens to data-driven evaluation enabling learning experiences that cater to individual students learning styles and needs. 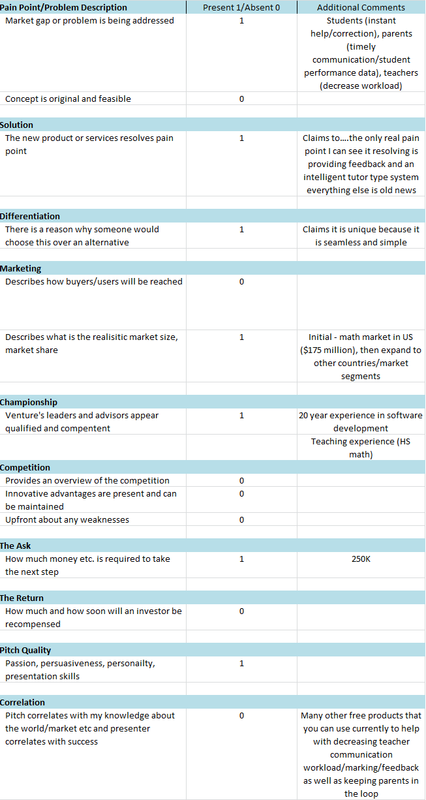 While the venture prospects for Personalized Learning are awesome in the long term, short- and medium-term opportunities will likely need to be highly strategic, leveraging existing platforms, targeting specific audiences, and delivering focused, accountable results.